Here are more piccies (I’ve also added more to previous posts) of the Walk on the Wild Side yarn – in the process of winding into yarn cakes. I got this fab little scale at J&R in New York, and a little ball winder. They are great! 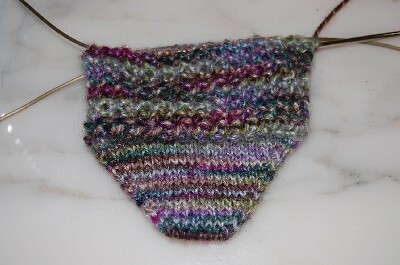 Still knitting obsessively at the pomatomus. I wish I could not go to work and just sit and knit all day! 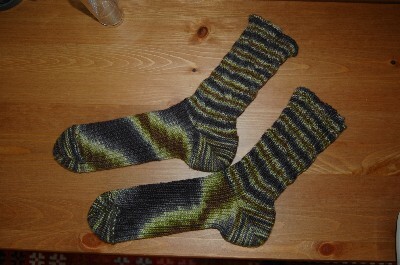 I’ve been knitting away at the Grasshopper, though am a little unhappy about the pointy toe. 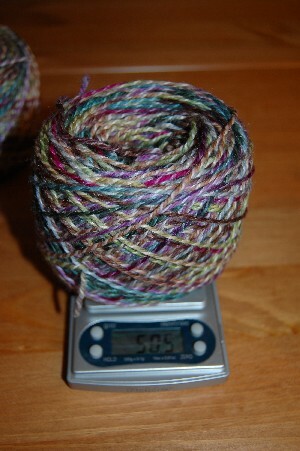 I cast on 7 stitches, instead of 9 (silly silly me) so it is rather elfine… still, it is lovely. 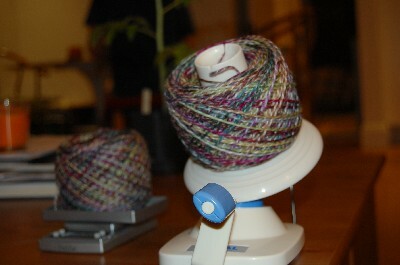 I actually think i like the colour better in the ball than on the sock, but it is more useful in the sock! 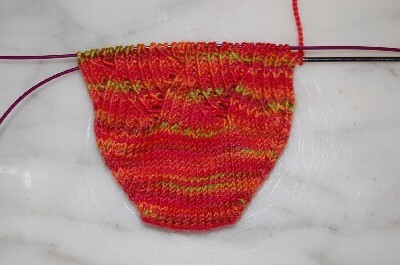 I am getting a little sidetracked by a fab cherry tree hill sock yarn – am doing the pomatomus sock from knitty, but toe up. That Cookie A is a genius. Have gotten just past the ball of my foot (like my grasshoppers). So far it looks amazing… dare i say it… even more amazing than the grasshopper? The colours are like a salmon – red orange with glints of bright green. Sigh. Am in love. In obsessive love. Boy am I a floozy! I went to a spinning (fleece) class (as opposed to the cycling fitness class) on Saturday, and learned to separate fleece, card, spindle spin and spinning wheel spin fleece. 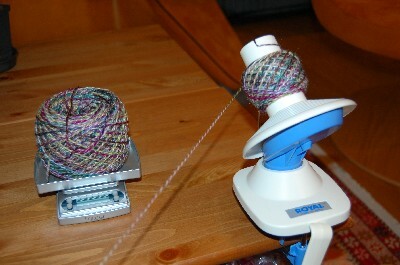 I made some double plied yarn out of jacob fleece, it was good fun but I don’t think spinning is my thing. Takes too long! Am too much of the MTV generation (I want it YESTERDAY!). But it was soothing, though the lanolin made my hands all sticky and gummy. And stinky (petting sheep is a stinky activity. My hands smelled of old lanolin and pee). Met some great gals, one of whom is the RSC! Planning on hooking up with the London set of the RSC at the Liberty’s Cafe knitting group on Thursday evening. That should be fun. Finally got my RSC April shipment today. So excited! 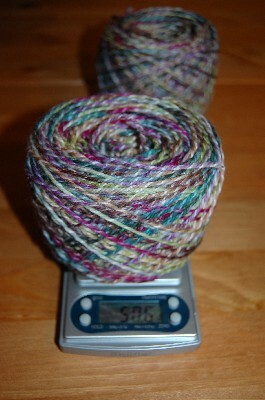 The yarn is gorgeous. Done! Finished my IOMs this morning. 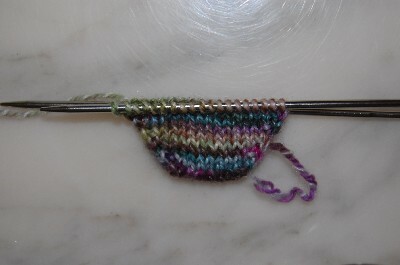 Used the EZ bind off (not really thrilled with it – I’ll have to learn the kitchener bind off for non standard 1X1 rib). Still, love my socks. 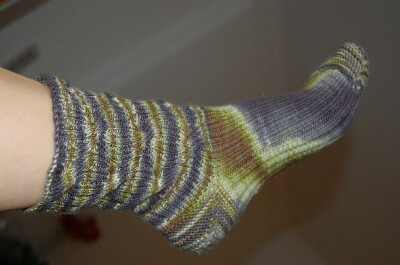 They are a bit snug going over the heel. 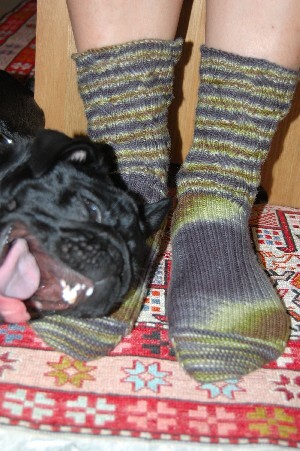 If I knit these again, I would use 2mm on the toe and heel and foot. Or even smaller as there is a good amount of give. I also wouldn’t do the cables on such a small needle. I would use 3.25 or even 3.75 as it is snug, and the cables have little give. I would use a different bind off, something like the kitchener bind off to match the ribbing. All in all I really enjoyed knitting these. Almost obsessively. Ok ok, obsessively. I liked watching the colours stripe up the sock. Might have been a bit boring otherwise. The cable was easy to remember, which made knitting it up a pleasure and compatible with sitting in a car, watching tv, chatting etc. 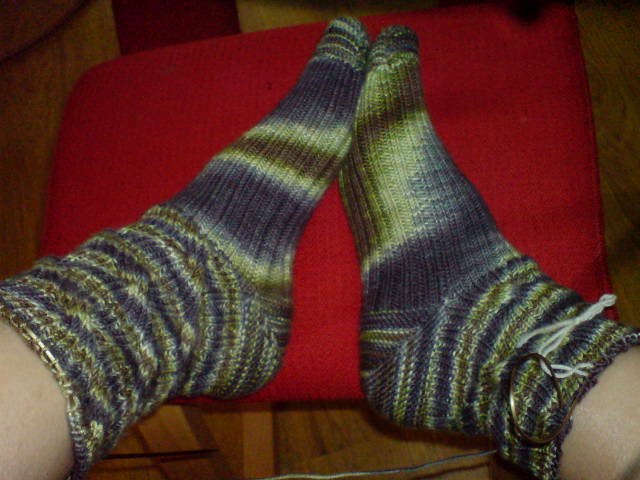 Socks almost done – 5 more rows left on Part II and then the bind off. the cable section is a little snug going round the ankle, but not too bad. The stripe has barberstriped its way up the leg, I think on Part II my tension was a bit tight, so the stripe sort of hung out on the sole for most of the foot, then came back round in time for the cabling. Here they are – gorgeous little things. 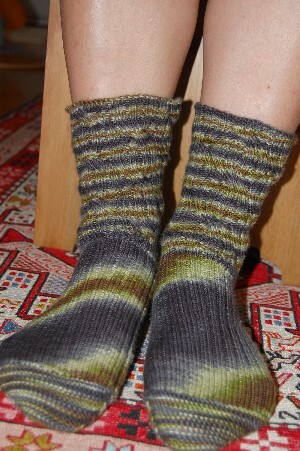 Almost done – once the second sock is at the same length as first, will try the EZ sewn bind off, or tubular bind off…. will see how things go! 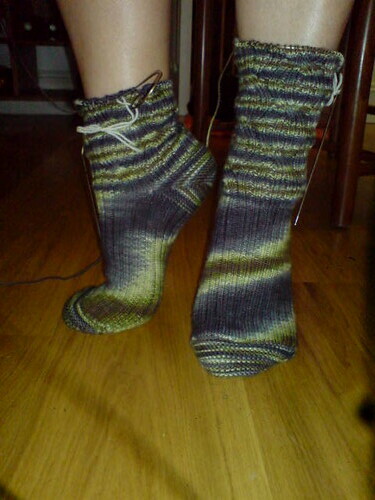 I have turned the heels on my IOMs, and now starting the 6″ cables. 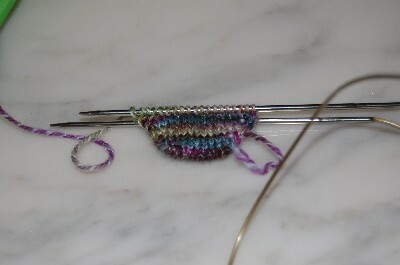 Thought about changing the needles to a bigger size, but then don’t fancy reknitting the other sock (the cable bit is a wee bit snug, needs a good tug to get around the heel). Hopefully will be done early next week!